T-Fresh is produced so that beginner and intermediate anglers can enjoy area trout ﬁshing easily. T-Fresh aims for further increasing catch rate with the same basic concept as T-Fresh. Anglers can freely manipulate T-Fresh on their own terms from a water-churning action, a wobbling action in regular retrieve to a rolling action in slow retrieve. 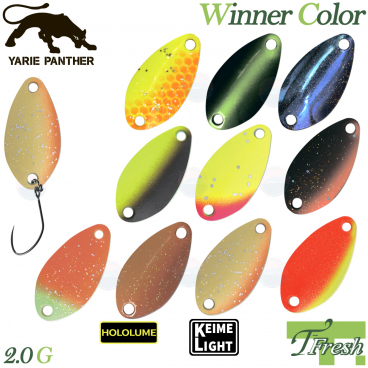 These colors help increase your catch with speedy and efficient process of fishing during the time when trout are moving after stocking until trout become inactive.